Manufactured for use in the Dental industry, our Monotrays Standard Trays offer an economical choice for busy environments. 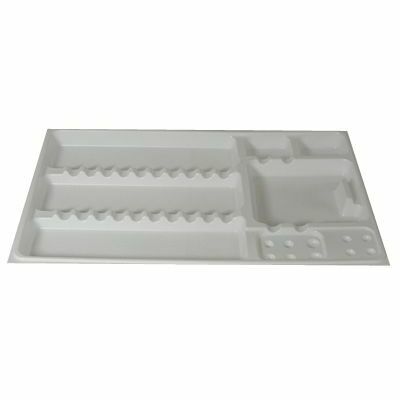 This large pack of 50 trays are best suited to the compartmentalisation of metal instruments during surgical procedures. Allowing the dentist to identify the correct tool for each stage of the job, these lightweight trays are manufactured from a thin plastic and should be disposed of after a single use. Offering three varying size and shape compartments along with indents along the bottom for gripping, the surface in each tray is textured to prevent slipping with grooves indented into the body for balancing items during use. When in storage, they can be stacked on top of each other and packed away in a compact manner. We also stock our Monotrays Standard in a mini size with alternative layout options.